How many of you have thought about how people are really using your website? Wouldn’t it be great to know which parts of your site’s design are actually contributing to the user experience? Having this knowledge can help you create the best site possible. Being able to understand the user’s experience gives you unique insight into how your design impacts why and how a user or customer interacts with your site. Figure out what helps and what hinders, and then build from there. You can do this with FullStory, a tool that allows you to record, replay, search and analyze user interactions on your website. Here’s a look at how the tool works. FullStory is a pixel-perfect session playback tool that empowers every person in your company to help build the best online experience for your site’s users. One tiny script captures every click, swipe and scroll on your site – no manual event-tagging required. 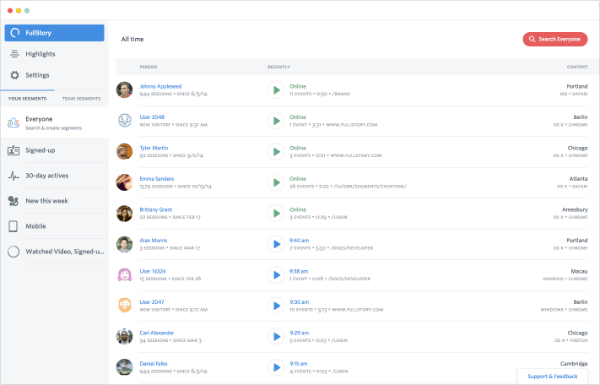 FullStory features high-fidelity playback (including the full DOM and console logs, exactly as they ran on your customer’s browser), funnel analytics, detailed search and customer segmentation, plus integrations everyone will want to use from bug-finding tools to support desks. It’s more than an analytics package. FullStory actually anticipates the answers to your common questions and compiles the data in a way that makes sense for your business. The tool records website interactions so you can go back and search how users engage with content. It provides insightful product management to help you see what features are working and helps you understand why. It enables you to gain insight and inspire customer-focused problem solving across your entire team. It empowers support teams so that they can respond to customers with answers and resolve issues more quickly, because they are able to understand the context surrounding every incoming request. It obtains all the information that website user logs neglect. Use this information so that your website developers can see bugs as they happen with actual users. Play the interactions, rewind or fast-forward to see how actions unfolded so you can really understand the problem. FullStory uses a search-driven approach to creating website insights. The tool can help you answer some of the most pressing question you have about your website. Which customers have we not seen recently? What did their last session look like? How does our mobile shopping experience work for first-time customers? What kind of paths do people take when visiting our site from a new ad campaign? What kind of events surround the moment when users share the website with their friends? What makes FullStory different from a tool such as Google Analytics is that you get back data that you can turn into actionable insights. So it’s not just a bunch of numbers on a screen; FullStory helps you understand why users act the way they do so you can lay out a plan to make your site better. FullStory’s interface is simple enough to use that everyone in your company – designers, engineers, PMs, support, marketing, analytics – can immediately jump in and can immediately jump in and learn something insightful. Share insights with a team using in-app sticky notes on recorded sessions to make teamwork a breeze. Every user action and every element of your page is automatically captured without the need to manually tag the actions you want to follow. Because every aspect of every user session is captured, you can use their Google-like search engine to answer any question, any time, with a rich data history. FullStory “searchies” anticipate how you want to visualize data from a search or segment and automatically create those charts and graphs for you. Got an AJAX-heavy, single-page app or a site built with modern frameworks like REACT or Angular? No problem – FullStory records it all perfectly. FullStory offers multiple plan types for different business sizes. Each plan allows up to 20 users so you can connect your entire team from the start (additional “seats” are available). 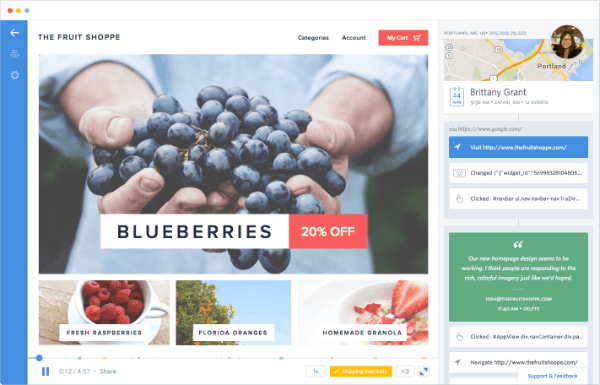 FullStory can help you find and analyze the right kind of data to make the most of your website design and convert users in the way you want. Don’t just take our word for it. Sign up today to get the full story about your customer experience – it’s free for 2 weeks!